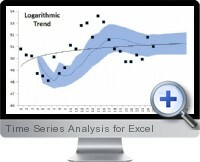 Time Series Analysis for Excel (NumXL) is a comprehensive and powerful add-in solution for Excel to provide analysis of time series and econometric data with forecasting options. Time series analysis functions can be called within cell functions or constructed using the intuitive function building wizard interface. Indispensable time series analysis calculations include autocorrelation testing, logarithmic fit analysis, model fitting and calibration, automatic forecasting and diagnosis of residuals. The resulting time series and econometric analysis is presented in a structured report in order to present conclusions and recommendations efficiently and effectively. Descriptive statistics - population mean, variance, skew and excess Kurtosis tests. Normality analysis - Jarque–Bera, Shapiro–Wilk and Chi-square tests. White noise analysis - Portmanteau, Ljung-Box and modified Q tests. Time series analysis - lag and difference operators, weighted moving Average, exponential weighted moving average, correlation and exponential weighted correlation, autocorrelation and partial autocorrelation analysis. Model fitting analysis - log likelihood, Akaike information criterion, stability checking and residuals analysis. Forecasting and back testing - in sample and out sample forecasts, mean and confidence interval forecasting, conditional and term structure volatility and long run forecasting.